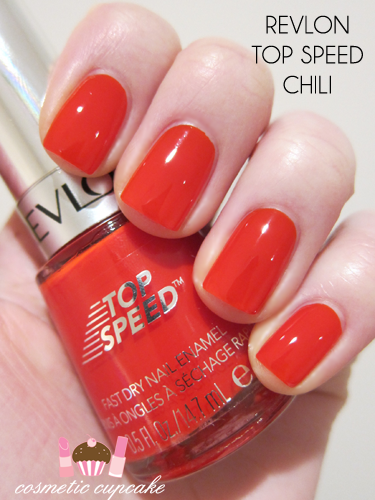 Today I have swatches for you from the new Revlon Top Speed™ fast dry nail enamel range. 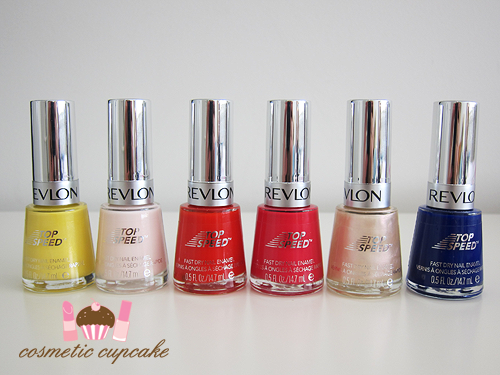 I must admit I haven't tried too many Revlon polishes so I was excited to be given the opportunity to try these out! Especially after seeing the bright colours in the collection and also the fact that these claim to dry in 60 seconds. 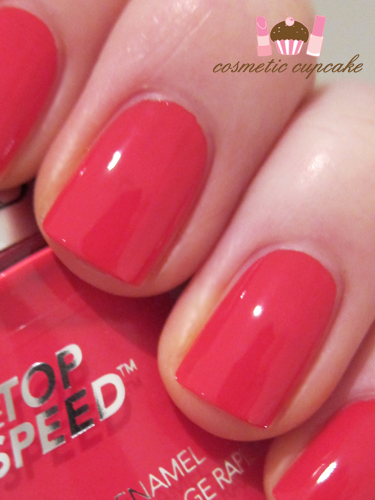 I am ALWAYS up for fast dry nail polish! "These days, who can spare more than 60 seconds? Revlon believes that looking glamorous doesn’t need to take all day. 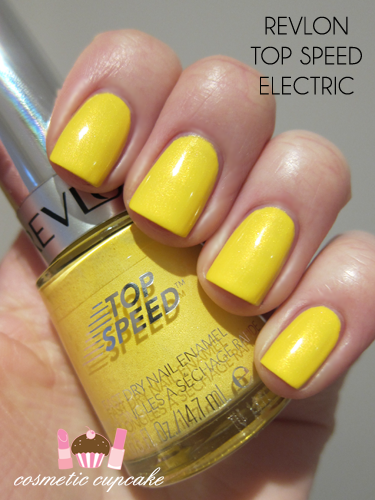 Revlon Top Speed™ Nail Enamel contains a patented formula which gives an amazingly quick, smooth lay down of colour for a gorgeous, super shiny finish in only a minute. With a revolutionary ColorPrecise™ Brush that is engineered to work seamlessly with the one coat, fast dry formula, Revlon Top Speed™ promises a salon-quality application every time – in half the drying time. And with the gorgeous array of runway-worthy shades, it will be 60 seconds worth sparing!" 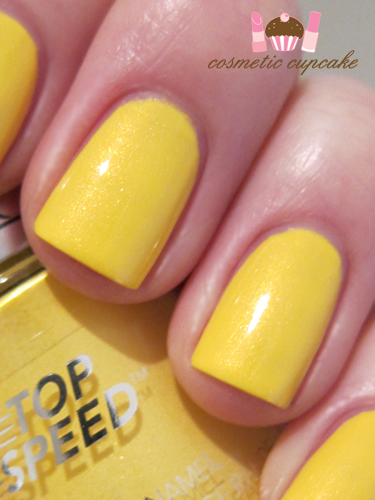 Electric is is an absolutely gorgeous shimmery yellow polish. To be completely honest I didn't have high hopes for this one as most yellows are a streaky mess. But boy was I wrong! It applied VERY well and I experienced no baldness or streakiness whatsoever. My favourite of the ones I was sent to try out by far. 3 coats is pictured. Sheer Cotton is a very pretty milky pink sheer. 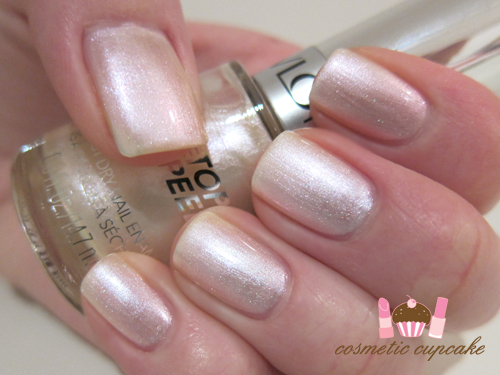 This indeed was a VERY sheer polish and unfortunately it was rather a pain to apply. It dragged terribly and therefore needed 4 coats which is pictured. I really like the colour though - it's a great cleanser colour if you need something toned down after wearing too many bright colours or something. 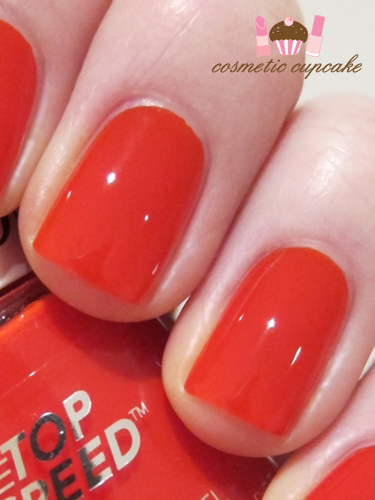 Chili is an almost neon orangey-red polish. 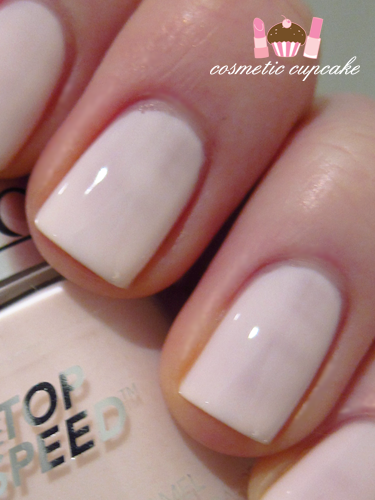 It has an almost jelly-like formula and is super opaque. 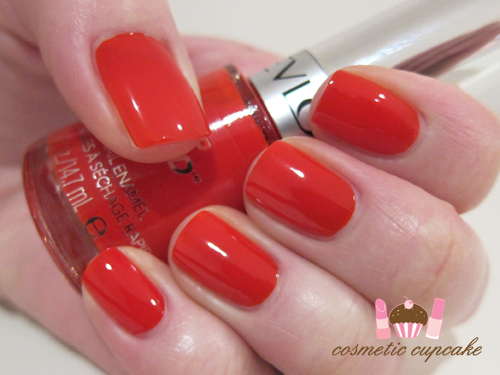 It was wonderful to apply and is just such a HOT colour! It really reminds me of chilli sauce! 2 coats is pictured however 1 would be enough. 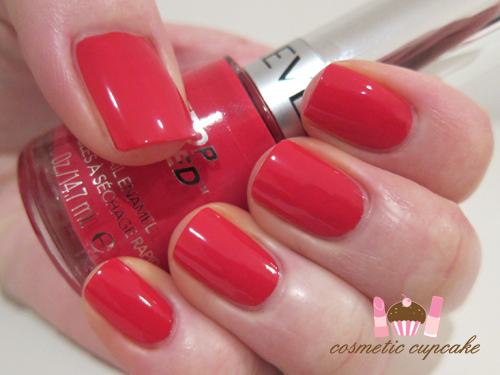 Jelly is a gorgeous pinkish red creme. In my swatches it leans more pink however in real life it's somewhat more red. It's super opaque and application was OK. 3 coats is pictured. 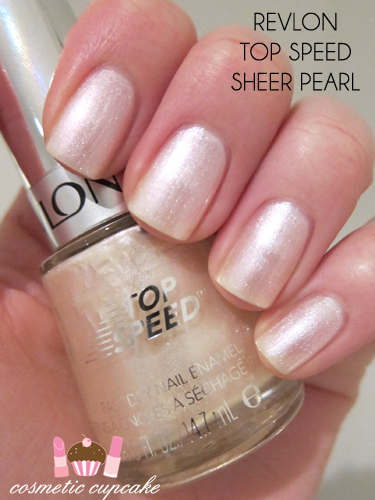 Sheer Pearl is a very pretty pearly shimmer polish. Because it has "sheer" in the name I didn't have high hopes but again I was wrong! It's very pretty and application was surprisingly good - it was opaque in 3 coats which is pictured. This is actually my 2nd favourite of the colours I was sent. 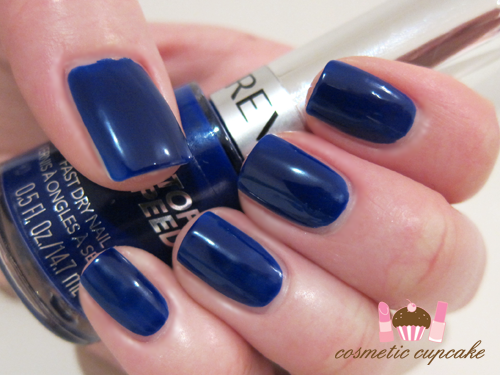 Royal is a gorgeous royal blue creme. The first time I applied Royal it was an absolute mess!! I couldn't get the brush to work for me and I flooded nearly every cuticle. When it came to actually swatching the polish however I had no issues with application at all but the formula is a little on the thin side. It's quite opaque and 2 coats is pictured and it dried to a semi-matte finish. 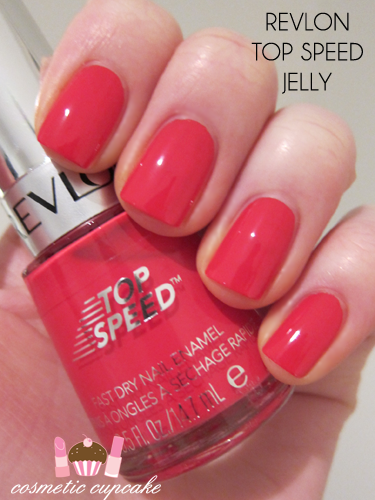 Overall: I enjoyed trying out the Revlon Top Speed™ fast dry nail enamels. The colours in the range are fantastic and there are 32 amazing shades to choose from! Being a colour person (when it comes to nails anyway!) I love that they have everything from pastels to reds to greens and vampy shades. There was some inconsistency with the formulas but I guess with 32 different shades in a collection you can't have everything ;) Dry time wasn't 60 seconds flat like it claims (I didn't time it down to the second) but it was definitely fast which is great. I did wear test a few of the colours and unfortunately they didn't seem to last all that long me. Royal chipped barely 12hours after application which was disappointing and Jelly and Electric lasted about 2 days. 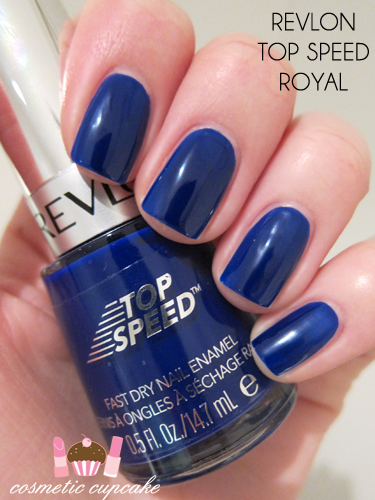 Details: Revlon Top Speed™ fast dry nail enamels are available now from leading department stores and pharmacies for $15.95. You can check out the shades on the Revlon Australia site. Have you tried these out yet? Have you got any favourite colours you can recommend? I love all the colors but the blue!! Pretty swatches but I wouldn't pay $16 for them. What are they in the US? $5? Awesome swatches! I have both Royal and Electric, and I love them. Royal is kind of sheer, but it's not that bad. Electric is apparently a dupe of Chanel Mimosa and I found it on sale, so that was even better. It's my favorite yellow polish. you rock them all so well.! :) But I think my fave one on you is Jelly! 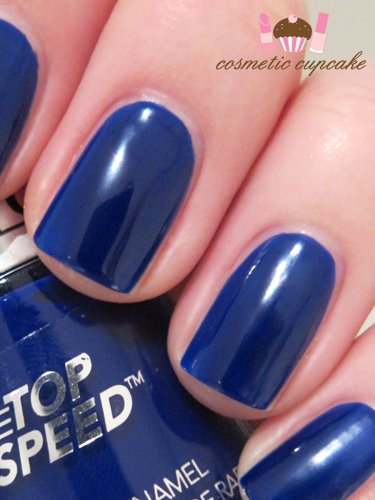 They look really great in your nails, the blue one is absolutely awesome! I bought Guava and it's a really gorgeous pink/coral which is perfect for wearing as summer gets closer. Wear wasn't too bad at all with this one. I haven't any revoln polishes but really I love the berry shade!!! the colors are so pretty loved the yellow one!